"Despite this general movement away from drill-based grammar instruction, it is perhaps ironic that many people new to the field consider this type of activity to be the essence of what CALL is. Drill-based activities most certainly still have their place in the language curriculum." The main ESL directories have wide grammar sections which include links to sites with grammar tutorials, exercises and activities. About.com : With quizzes for different learner levels and grammar topics. Activities for ESL Students : Grammar Quizzes about Places and different levels (Easy, Medium and Difficult). Basic Grammar : For lower levels and review. Clicknlearn : Multimedia activities for Spanish Secondary Education students. E.L. Easton : Grammar section with links and exercises related to different parts of speech (Adjectives, Articles, Conjunctions, Nouns, Prepositions, Pronouns, Verbs). English4U : Alphabetical classification and level rating. English-Hilfen : Excellent German site with tutorials and related exercises. You can subscribe to their newsletter with the latest news. ESLGold : From low beginning to advanced. Learnenglishfeelgood.com : English grammar tests that focus on topics that ESL students often find difficult to understand. Manythings.org : Some of the quizzes you can find here are also at the A4ESL site. NonstopEnglish : If you register and login you can see which tests you have done and how successfully. Road to Grammar : More than 300 interactive exercises and a section for younger learners. World English : Exercises and tests covering the main areas, including a diagnostic grammar test. BBC Skillswise Games : A lot of linguistic games. English-Online Games Zone : Language games to download and play online. Grammar Gorillas : Parts of speech game. Grammar Ninja : Arcade game to identify parts of speech. Grammar Safari : Suggestions for "hunting" and "collecting" examples of specific words and structures as they are used in documents accessible to anyone on the Internet. Grammarman Comic : Comics to learn grammar. Happy Verby Gang : Created by Isabel Pérez to teach tenses. Learnenglish.org : British Council site with interactive grammar games. Netgrammar : Lesson plans on grammar contents with explanations, exercises and skills practice. Starship English : Verb tenses game. Tenses : English tenses tutorial. Now that you have visited all these rich grammar practice sites, you should forget about them according to Steve Kaufmann's language learner's manifesto. ...The only way in which learners are able to have access to 'unlimited' language input is through authentic communication, be this with native speakers or with other learners of the language. The choice of the appropriate form of computer mediated communication is a difficult one, and different types of CMC allow for emphasis on different aspects of language learning." "Whereas much grammar learning might best be carried out through explicit grammar teaching, we have seen that CMC tasks offer a wealth of opportunities for learning through language practice that is not directed specifically at the teaching of any particular grammatical point... CMC provides a mechanism for valuable communication, but shaping the mechanism into valuable opportunities for learning is the pedagogical challenge. Here the research is very difficult to interpret because researchers have studied a variety of phenomena, but the overall finding is that teachers need to plan for good CMC exchanges." This post is part of "The First ELL, ESL & EFL Carnival"
It is frequently said that the Web is full of teaching and learning resources. What kind of language teaching resources can we find on the Web? What do we mean by "web teaching resource"? Teaching resources in general are a source of aid or support that may be drawn upon when needed to enhance the quality of teaching and therefore facilitate learning. They may be physical (board, book, poster, video projector, chart, ...) or conceptual and methodological. When we refer to web teaching resources we are talking about the different kinds of materials and tools that we can find on the WWW, with the same purpose of improving the quality and efficiency of learning in activities which make use of those resources. Therefore, a first distinction can be made between materials, which provide contents, and tools, which let us process those contents, create our own materials or interact and collaborate with other people in learning environments. The type of web resources to be used will depend on the kind of activity to be developed. Teaching materials. They are usually created with a curricular didactic aim and may include different kinds of documents and activities: practice exercises (grammar, vocabulary, skills), tutorials, simulations, games, etc. Authentic materials. Their communicative or social function is authentic; they haven't been modified or adapted for teaching purposes. They can be used as a resource in discovery based learning activities and web tasks for language learning. Reference materials. Dictionaries, encyclopedias, manuals, concordancers online. This could be an initial sketch to be completed and developed. Internet as a language learning resource is not only an immense network of contents with multimedia facilities, but also a communication technology that promotes interaction with other people and the media, providing the conditions for a more socio-constructive, cooperative and student-centered kind of learning, which takes into account the learner needs and fosters her or his autonomy. Sing along changing YouTube for MyBlogs, Twitter or Facebook. However, language learning activities which involve the use of the Internet needn't be limited to computer mediated human-to-human communication. Traditional CALL activities can also be developed in NBLT and are actually found in most LT sites. As we know, the Web is full of authentic, reference and didactic materials useful for language learning. It also provides excellent tools for the interaction with those materials, processing information (input) and student production (output). And for linguistic contents and skills work, either integrated o specific. Lexical quizzes, games and other vocabulary learning specific activities (e.g. lexical maps, concordancers use, class dictionary building ...). Grammar tutorials, exercises, simulations and games. Listening and pronunciation virtual lab activities. Use of blogs and wikis for individual or group language learning e-portfolios. "There are 10 chapters in this book: an introduction, seven chapters that cover the dimensions of CALL, and two concluding chapters that complete the book." The concluding chapters deal with ICT integration ("what integration really means and how it might be accomplished in institutional settings such as schools and universities") and the distinction between emergent CALL and established CALL. "One of the real problems for the language teacher, software designer, or researcher who wishes to use technology in second -or foreign- language education is how to absorb and relate what has been achieved so far, and how to make sense of it. The kind of understanding that comes from a critical reading of a substantial literature in order to develop a balanced and detailed knowledge of the field is not easily achieved. CALL Dimensions has been designed to address this problem." It certainly does, with an excellent academic review of research done in the period 1995-2005, giving an accurate picture of the development and diversity of CALL in those years. Each chapter is divided into two sections: description and discussion. The description section reviews the recent literature of each dimension, identifying themes and selecting representative projects. The discussion section provides some analysis with further ideas and opinions from teachers. However, as a teacher, don't expect ready to use materials, lesson or syllabus plans or even a selection of web resources. It isn't the aim of the book. 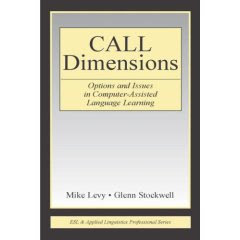 This is mainly a research and theoretical review of CALL dimensions. But some important recent developments are missing or only just mentioned and not seen in depth: the educational use of wikis and its possibilities in language teaching, the use of blogs as language learning eportfolio, the use of new multimedia online tools and social web tools, podcasting and videocasting, the development of communities of practice (the important work developed by Webheads in Action is not mentioned) and the use of webquests in language teaching is only mentioned in a couple of pages. It seems that this rich dimension of emergent CALL is still to be developed or is being developed in the language teaching blogosphere and social networking. 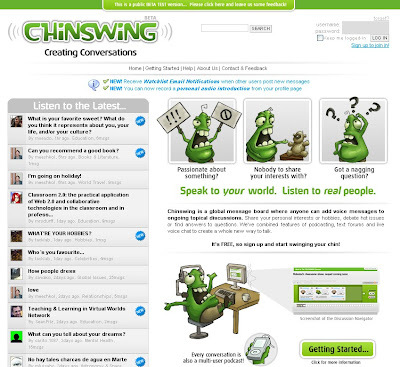 Chinswing is a global message board where anyone can add voice messages to ongoing topical discussions. You can listen to conversations about Classroom 2.0, Teaching and learning in virtual worlds, Dreams, How people dress or Your favourite sweet, among others. You can record your own message on the chosen topic. Respect Developmental Processes and "Learner Syllabuses"
What is task based language teaching? a presentation by David Nunan. Which are the elements or characteristics that describe optimal language learning activities and environments? Learners have opportunities to interact socially and negotiate meaning. Learners have enough time and feedback. The linguistic characteristics of the target language input need to be made salient. Learners should receive help in comprehending semantic and syntactic aspects of linguistic input. Learners need to have opportunities to produce target language output. Learners need to notice errors in their own output. Learners need to correct their linguistic output. Learners need to engage in target language interaction whose structure can be modified for negotiation of meaning. Learners should engage in L2 tasks designed to maximize opportunities for good interaction. It seems that the focus on linguistic form (hypotheses 1 and 2) and learners error noticing and correction (hypotheses 4 and 5) are not present in Egbert's conditions (although "learners having feedback" is somehow related to "error noticing"), perhaps because these refer to environmental conditions and Chapelles's hypotheses refer to materials development. Another difference is that Egbert's emphasis on authentic tasks and audience is not present in Chapelle's list. Results of the World's Best Presentation Contest at Slideshare. They can be useful for English learning and a model of good presentations for students projects (and inspiring for language teaching presentations). Is Krashen's Monitor Theory no longer valid? The Acquisition-Learning hypothesis: Krashen claimed that formal instruction, or learning and studying about a language, is a different process from the natural acquisition that takes place as a subconscious act similar to the way children begin to understand their native language. We use learning to produce correct form or grammar, while acquisition is used to understand and produce meaning. As an example, if someone wants to learn Russian, she could learn Russian by taking classes on Russian grammar and vocabulary, but she could acquire the language by reading and listening to Russian texts or living in Russia and interacting with the people and culture in that country (how about interacting with Russian people through the net?). The Natural Order hypothesis: There is a natural, predictable order in which people acquire language. It is the same for each person and independent of the instruction program (this is related to Chomky's mentalistic view of language). The Monitor hypothesis: The learned system should have the purpose to self-monitor production. It is somehow related to the goal that the learner may be able to identify and correct mistakes or ask for help and reflect on the process of acquisition. The Input hypothesis: People acquire a language by receiving comprehensible input. This input should be slightly ahead of a learner’s current state of knowledge (i + 1). The Affective Filter hypothesis: When the learner is experiencing high anxiety, low self-esteem or low motivation, the filter turns on and causes the learner to block out input. Learners need both comprehensible input and a weak filter, that is, a learning environment free of stress and anxiety, where the learner is not forced to produce and can progress at his own pace. Krashen suggests that adolescence and puberty may not be good periods for SLA, as this ‘affective filter’ arises out of self-conscious reluctance to reveal oneself and feelings of vulnerability. "The model has been criticised by many linguists and is no longer considered a valid hypothesis. Its continuing value in the field is only for its historical significance, and the research it has inspired. McLaughlin (1987) claims that none of the hypotheses is clear in its prediction. For example, the acquisition-learning distinction is not properly defined and the distinction cannot be empirically tested. If only acquired forms can lead to spontaneous speech, as Krashen claims, then it should be impossible for anyone who learns a foreign language in a classroom, and is taught it in their native language, to ever be able to produce spontaneous speech in the target language. This is clearly untrue. Likewise, Krashen provides no criteria for establishing i+1, or for delineating different levels of input..."
Although Krashen doesn't give enough importance in his model to comprehensible output and interaction (he explains why in this article) and we may agree with some part of the criticism, I still think that Krashen's key ideas should be taken into account when deciding on the learning environment and the kind of activities for our students. Join Twitter and let the world know what you are doing. You can follow my twitter messages here. Have a look at twittermaps and twittervision. One of the problems in the CALL field is the lack of a clear and articulated theoretical base that is commonly shared. New insights and applications coexist with old ideas on technology and how a language is learnt. Our methodological orientation requires a theoretical base providing pedagogical principles to guide our decisions. A better design and evaluation of CALL activities should be provided by the insights from theoretical developments in Second Language Acquisition (SLA) theories, instructional models and theories on learning and knowing and Skill Acquisition Theory (SAT) . Review of ZACHARIA, G. & ZAPHIRIS, P. (eds.) (2006), User-Centered Computer Aided Language Learning. A few posts ago I promised to review Smith & Baber (2005) and Zacharia & Zaphiris (2006) . I have been told by Amazon that the first one is not available (if someone knows where I can get it, please tell me). In the preface we are told that the key objective of the book was to look at the topic of CALL in a new direction by focusing on the human-computer interaction elements of learning a language online. "Due to the increasing popularity of the Internet and the use of multimedia, there has been a recent move of CALL systems from CD-ROM to Web-based systems, making it possible to create systems that can facilitate the emergence of online communities of learners." 1. Ang, C.S. & Zaphiris, P., “Developing Enjoyable Second Language Learning Software Tools: A Computer Game Paradigm”. It is suggested that ludology and narratology theories of computer games can be useful in designing language-learning software applications, providing a better framework and "making the experience of learning more immersive and engaging". Two case studies are compared: Slime Forest and Alien Language. 2. Lambropoulos, N., Christopoulu, M. & Vlachos, K., “Culture-Based Language Learning Objects: A CALL Approach for a Ubiquitous World”. 3. Farmer, R. A., “Situated Task Analysis in Learner-Centred CALL”. 4. De los Arcos, B. & Arnedillo Sánchez, I., “Ears before Eyes: Expanding Tutors’ Interaction Skills beyond Physical Presence in Audio-Graphic Collaborative Virtual Learning Environments”. In audio-graphical learning environments interaction certain aspects of non-verbal behaviour are absent. We are introduced to strategies to deal with turn-taking, time lag and other incidences, while observing the difficulty in applying a communicative approach in these settings and the differences between face-to-face and virtual classrooms. 5. Coit, C., “A Student-Centered Online Writing Course”. A student-centered online writing course, where peer corrections were the sole source of feedback. 6. Lonsdale, D., C. R. Graham & Madsen, R., “Learner-Centered Language Programs: Integrating Disparate Resources for Task-Based Interaction”. Theoretical foundations and design of the GEDspeak application. 7. Veiga Marriott, R. C. & Lupion Torres, P., “LAPLI - The Language Learning Lab: A Methodological Proposal for a Hybrid Course in a Virtual Environment”. An interesting virtual learning environment design for advanced students with 12 types of activities working with Internet materials and concept maps. 8. Gstrein, S. & Hug, T., “Integrated Micro Learning During Access Delays: A New Approach to Second-Language Learning”. On micro learning materials designed for mobile devices. 10. Chan, W. M., “Metacognition and Learners’ Interactions with a Web-Based CALL Grammar Exercise”. 11. Melton, J., “The Effect of a Native-Language Interface vs. a Target-Language Interface on Students’ Performance”. 12. Schcolnik, M. & Kol, S., “Reading and Learning from Screen”. 13. Hirata, Y., “Evaluating Students’ Perceptions of ‘Online Counselor’ for Independent Language Learning”. 14. Vrasidas, C., Landone, E., Christodoulou, N. & Zembylas, M., “Language Learning and User-Centered Design: The Development of the Electronic European Language Portfolio”. ICT for Language Teachers is a new blog started by Graham Davies. It aims to encourage feedback on the ICT4LT site in particular and the use of ICT in language learning and teaching in general. The first posts are about virtual learning environments, podcasting, interactive whiteboards, presentations, reports on the effectiveness of ICT and digital language labs, with lots of interesting information and references. 1. Focus on activities, not software titles. Effective lab classes generally revolve around a well thought-out activity that involves content accessed via computers with stimulating student interaction in the target language. Teachers new to CALL are often put off by the perception that they must be technical gurus, that they must know how to do everything in order to do everything. They don't. Most teachers are familiar with word processing, e-mail or web browsing. Lab class should provide human instruction time and contact with each student. 4. Appreciate the richness of the computing environment. The complexity of this environment frequently leads students to seek help, either from the teacher or, preferably, from a classmate -thus the importance of pairing students or at least seating them according to unlike L1s. 5. Prepare and be patient. Be familiar with applications you have students use so that you can answer questions knowledgeably. Work through every activity in advance, and anticipate what problems students might encounter. This familiarity is as much the teacher's responsibility as knowing other materials used, such as textbooks. 6. Don’t let technology drive your class. Don't use technology for technology's sake, because it's there, or let it become an end in itself instead of a means. Recognize the difference between taking advantage of a stimulating language learning environment and letting it dictate what you do... Think of an interactive language activity first, then look to technology to enable it, if possible. 7. Invest time in training and orientation. Don't assume that students know computers or each program because they're young. They don't... Taking the time to walk students through the use of a new application or activity as a class will save time because it's easier to say something once to the class before an activity. Allowing students to complete activities at their own pace is part of the beauty of CALL... Have buffer activities ready for students who finish earlier... Transitioning from one activity to another takes time... Students are slow to change gears when they're at the wheel (that is, the mouse), so segue from one activity to another without abruptly interrupting their momentum. New activities must overcome the inertia of the preceding one while addressing the technical overhead of the new one. 9. Be a resource guide. A lab teacher's skill is largely exhibited in his or her ability to choose appropriate and effective materials and activities and to teach access skills and epistemology, particularly of the enormous Internet resources. As a lab teacher, you are the librarian of the lab in that it is partly your responsibility to introduce students to appropriate lab resources, whether used in class or not, in fact, especially for relevant materials you won't have time to use in class. A CALL's teacher job is to orchestrate communicative activities that are student centered and student empowering. In a CALL lab, students have an expectation of hands-on work and active participation more than passive listening; they are more predisposed to doing something. Give them instructions for an activity, and let them have at it. Develop open-ended activities where students create as much as possible and are not arbitrarily restricted to a narrow, predefined model. Stage I : Structural CALL (1970s-1980s): Grammar-translation & audiolingual teaching; view of language as a formal structural system; mainframe technology; drill and practice as principal use of computers; accuracy as main objective. Stage II : Communicative CALL (1980s-1990s): Communicative language teaching; cognitive view of language (mentally constructed system); microcomputers as technology and communicative exercises as principal use; not only accuracy as main objective, but also fluency. Stage III: Integrative CALL (21st century): Content based, ESP/EAP teaching; socio-cognitive view of language (developed in social interaction); multimedia and internet technologies; authentic discourse as principal use; agency is added to accuracy and fluency as main objective. I do not want to suggest that these stages have occurred sequentially, with one following the other, from "bad CALL" to "good CALL". At any one time, any of these may be combined for different purposes. However, there has been a general trend or development over the years, with new ideas and uses of computers being introduced in combination with those previous. In the last years new possibilities of communication and collaboration have appeared thanks to web 2.0 tools, which make it easier to participate and share resources online. Podcasting and video sharing in virtual communities are among these new possibilities of practice and interaction. Sound and video files are easily created and downloaded to portable devices or shared in community portals, wikis or blogs. Nevertheless, the teaching exploitation of these new resources and practice and its integration into the school processes of teaching and learning is something to be developed.